The Aesthetica professional style for vBulletin 4 is available in Blue, Red and Purple color schemes, so you can choose the one that best suits the needs of the online community powered by VB4 that you are creating. The Aesthetica skin comes with fixed and fluid width vBulletin styles, detailed step by step installation guide, header and footer graphics in PSD format for easier modification. If you want to stand out from the crowd using the default vBulletin forum theme, then you can get this alternative stylish skin for your forum. 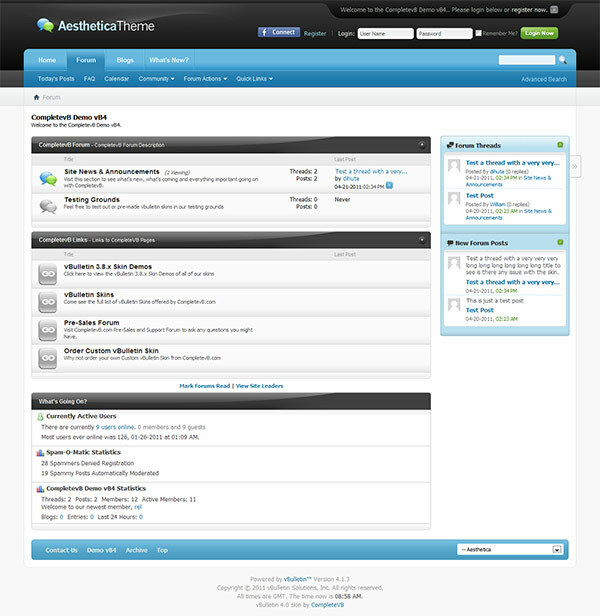 The Aesthetica style comes with 1 year support & updates and the theme supports vBulletin versions 4.0.6 – 4.1.3.